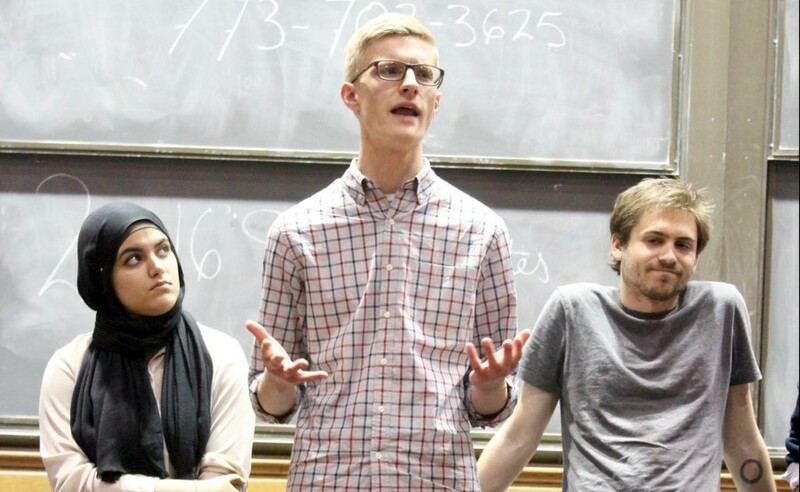 Student President Calls Free Speech Letter "Messed Up"
SG President Eric Holmberg speaks at the Student Government election debate on April 26. Student Government President Eric Holmberg said in an interview that Dean John “Jay” Ellison’s letter condemning trigger warnings and intellectual safe spaces exploited a “false narrative” of coddled millennials for publicity. Holmberg called the letter “hypocrital,” saying that the University hasn’t done its part to engage in challenging discourse with its students. He noted that activists have struggled to get administrators to attend their meetings. “Of anyone else on campus, the administration is far more fearful of challenge and discomfort than any student I know,” he said. “It’s ironic that during my time at the University of Chicago, administrators have continuously sought to create a comfortable space for themselves free of challenge by avoiding engagement with student leaders,” he said in a statement. In the op-ed, Zimmer wrote, “Universities cannot be viewed as a sanctuary for comfort but rather as a crucible for confronting ideas and thereby learning to make informed judgments in complex environments.” He spoke broadly about the University’s commitment to free expression, but he did not specifically address safe spaces or trigger warnings. “If that’s the case, the letter did nothing to make that apparent,” Holmberg said, responding to the University’s assertion that the letter was only about intellectual safe spaces. Asked about the University’s response to the disruption of speakers by protesters, Holmberg said that he was also disappointed. In the wake of a call by Institute of Politics Director David Axelrod for the University to discipline students who interrupt campus events, Provost Eric D. Isaacs announced the creation of a faculty committee to reevaluate the range of possible disciplinary actions for students who shut down or interrupt speakers. Former Student Government President Tyler Kissinger responded at length to the letter on Twitter, echoing Holmberg by calling the letter a “PR shot.” Twitter compiled his tweets into a Twitter Moments post.